This is the device Google should have used to launch its new OS. Android Wear 2.0 recently made its debut on a pair of LG-made watches and, as expected, we're starting to see other companies show off devices of their own running the new operating system. At MWC this weekend, Huawei is unveiling its Watch 2, which combines the new Google OS with a sportier design. It will be available in the US in April, and in some European countries in March for €349 (about $350). After my brief time with the new timepiece, which is also available in a "Classic" design, I'm already impressed by how comfortably light and sturdy the two watches are. The classic Watch 2, with its black face and leather band, is very basic-looking. But what it lacks in style it makes up for with comfort and quality. The watch's round 1.2-inch face (which is the same size as the LG Watch Style's, by the way) is surrounded by an etched ceramic bezel that, despite somewhat engulfing the otherwise dainty display, adds a premium feel to the device. The hybrid-leather band is made of smooth leather on top and jointed rubber on the underside, making it both stylish and comfortable. The regular model has a sportier design than its relatively vanilla counterpart. I liked the yellow accents on the gray/yellow one I tried, and I was surprised and pleased at how light the Sport felt without coming off cheap. 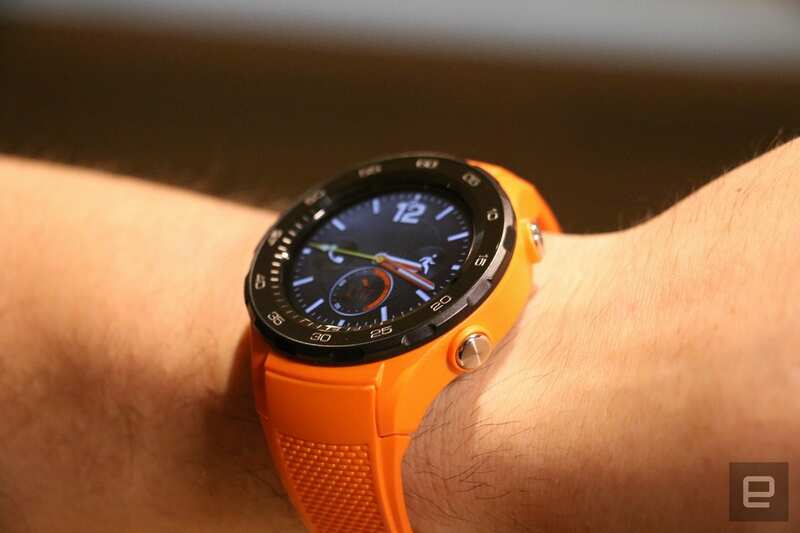 Other color options of the Watch 2 include black and bright orange bands. If you prefer a strap of your own, you can easily swap one out using the clasp on the underside. Unlike the LG Watch Style and Watch Sport, the new Huawei wearables don't offer a rotating crown on the side of their faces. That's a bit of a bummer, because Android Wear 2.0's new scrolling interface, which can be controlled by the knob on the LG devices, was one of our favorite new features. You can still use your finger to scroll up and down pages of apps or notifications, which isn't as fast, but is at least an improvement over Android Wear's once swipe-heavy navigating system. Not only is the Watch 2's look sportier, but its software has some bonuses for fitness fans as well. Huawei has added its own Fit feature that customizes workout plans for specific activities such as running, cycling or hanging out on the treadmill. No worries if the watch gets wet with your sweat or if you are caught in the rain mid-jog: The device meets IP68 industry standards for water-resistance and will survive. The rest of the Huawei Watch 2's specs aren't bad either. You'll get NFC support for Android Pay and a heart-rate sensor on both the regular and Classic versions, which are two features the LG Watch Style did not offer. The regular Watch 2 will also have LTE support in certain regions, although it's not clear if that will be available in US models. Both editions of the Watch 2 are powered by the same Snapdragon 2100 chipset as on LG's new watches. But Huawei has a leg up on LG in one key area: battery life. By squeezing a 420mAh cell in these devices, Huawei promises up to two days' worth of endurance. Plus, with a new feature called Watch Mode, which disables everything except for a watchface and the pedometer, the Watch 2 is said to be capable of lasting an impressive 25 days. That's a pretty lofty claim -- one we're hoping to be able to test out very soon. At just €329 (roughly $350), the Watch 2 is reasonably priced for what it offers. It will be available stateside in April, with pricing expected to be announced closer to launch. Meanwhile, those hoping for promising Android Wear 2.0 alternatives to the LG watches we reviewed recently now have something to look forward to.